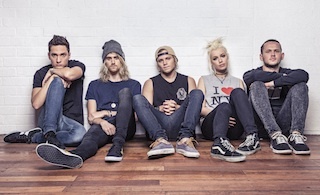 A huge congratulations are in order for ATP's favorite pop/rock quintet, Tonight Alive! The band's stunning new album The Other Side debuted at number five this week on the Australian ARIA Albums Chart. A message from vocalist Jenna McDougall can be found below. "#5 baby! Thank you to all our Aussie fans that either preordered or went and picked up #TheOtherSide in store this week! Feeling really grateful and really proud! Never thought we'd place on the Aria Charts."